Exterior view of church entrance, with huge ceramic mural executed by Claude Vermette, and interior view of a decorative panel "Blessed Virgin Mary" designed by J. C. Charuet. Additional interior view of round altar in the centre of the church. Handwritten in blue ink on verso of one image: Beth Tzedec synagogue March '58 (Harry B Kohl, Page & Steele). [Archivist's Note: This is an incorrect attribution. 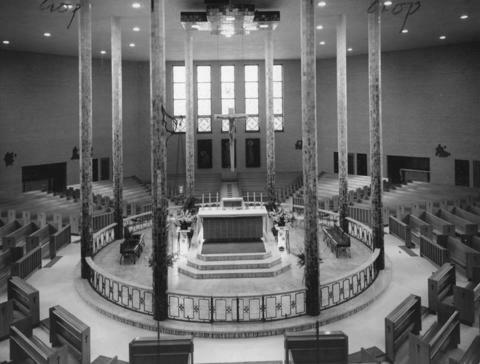 The Beth Tzedec synagogue is pictured in the same article in the March 1958 issue of Canadian Architect, but this image is clearly credited as belonging to the Church of Notre Dame de la Salette. The subject being Christian imagery, the article caption is probably correct.] The other photographs also have handwriting on verso: Church of Notre Dame de la Salette (Paul Goeyer) March 58. "Outward and Visible Form." The Canadian Architect March 1958: 35-42.